Twelve Alaska bison are scheduled to depart next week for the Russian Arctic to participate in an unusual experiment and documentary, recreating an ice-age ecosystem, complete with a modern version of the woolly mammoth, looking for ways to slow climate change. "We're hauling bison to Siberia to save the world," said Luke Griswold-Tergis, an independent filmmaker from Haines who is organizing the unusual cargo flight of the 500-pound critters. 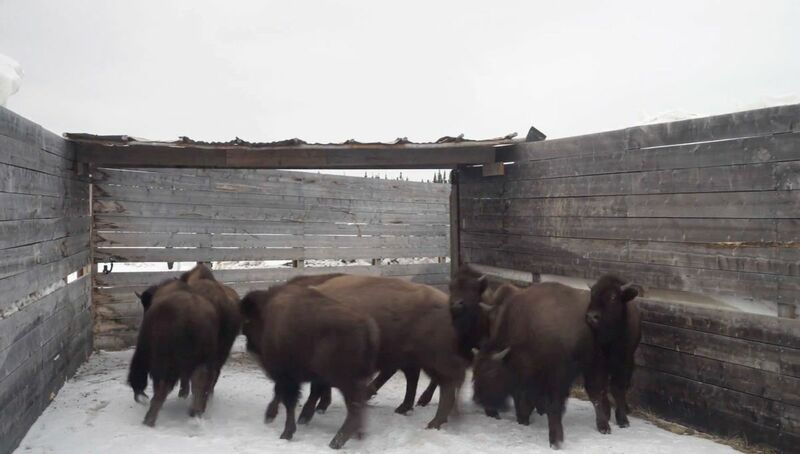 The effort to ship the yearling animals from the Stevens Village Bison Farm near Delta Junction will be part of a film that Griswold-Tergis is making about Russia's Pleistocene Park, he said. At the park, in a 6-square-mile "test plot" near the town of Chersky, the bison will join lots of reindeer, yaks, horses and other herbivores, he said. Those animals once roamed across the region. If things go according to plan, the plant-eating animals will prevent the growth of trees and shrubs, promoting the expansion of grassland, he said. Grasslands and snowy plains in winter reflect solar radiation better than areas with trees and shrubs, reducing impacts of climate change, Griswold-Tergis said Tuesday. The herds will also help remove the snow's insulating properties by trampling on it, allowing the ground to stay frozen longer. The park's goal is keeping permafrost from melting so that the massive amount of heat-trapping carbon it contains is not released into the air, making global warming worse, he said. "These 12 baby bison are admittedly a very small step toward solving a big problem, but they are part of the proof of concept" that could be repeated elsewhere in the Arctic if it works, he said. The park, more than 800 miles northwest of Anchorage, also hopes to acquire a modern version of the woolly mammoth, if one can be made by scientists hoping to alter the genome of elephants. The giant land mammals were part of the Pleistocene era — commonly called the ice age — that ended about 12,000 years ago. Harvard geneticist George Church is working on that effort and plans to visit the park this summer, said Griswold-Tergis. Church hopes to have the first mammoth ready for the park by 2027, he said, according to The Atlantic. Griswold-Tergis said he plans to name his film "Pleistocene Park," partly in a nod to the blockbuster "Jurassic Park" movies that feature cloned dinosaurs. "This all sounds really crazy," he said. But the project leader, Nikita Zimov, and his father, Sergey Zimov, the park's founder, are legitimate scientists, he said. Lining up a flight for the bison from Fairbanks hasn't been easy, Griswold-Tergis said Tuesday. He said he's still wrapping up final details for the trip. On Monday, the animals are expected to be loaded into crates and placed in an old DC-4 cargo airplane, he said. They've passed veterinarian inspections and are quarantined to make sure they meet requirements for traveling to Russia, he said. "Dealing with customs in Russia has been really, really complicated because no one has (flown) livestock from Alaska to Siberia as far as I know," he said. Griswold-Tergis said he called every cargo airline in Alaska, and only Alaska Air Fuel of Palmer agreed to make the trip. "They are saving our butts," he said. "One place I called up said, 'Is this my son playing a joke on me?' Other people were like, 'You said what? Where? We don't fly to Russia.' "
Griswold-Tergis said he has helped raise money for the project throughonline fundraising sites, including Indiegogo. Last year, he traveled overland to the park thousands of miles, helping safely deliver 10 Russian yaks to the park. His plans for the film took a back seat to helping the park, but it's made for good images and storytelling, he said. Shipping the unnamed bison, three females and nine males, is approaching $200,000. The filmmaker said he'll fly with the bison to Chersky, with a stop in Anadyr near the Bering Sea. Joe Burgess, the bison farm manager, said the main thing Griswold-Tergis will need to look out for is making sure the animals, built to handle the cold, don't overheat in their crates. They'll be loaded into their crates, then shipped on a flatbed to the airport in Fairbanks. "I'm hoping for the best of luck," he said. Griswold-Tergis said that on the flight to Russia, space in the cargo hold will be tight. He'll give the bison water through a hose, crawling atop their crates to reach them. They'll get a mild anti-anxiety drug for the trip, scheduled to take less than 24 hours, from a Delta Junction veterinarian. "We're doing everything we can to reduce their stress," Griswold-Tergis said.